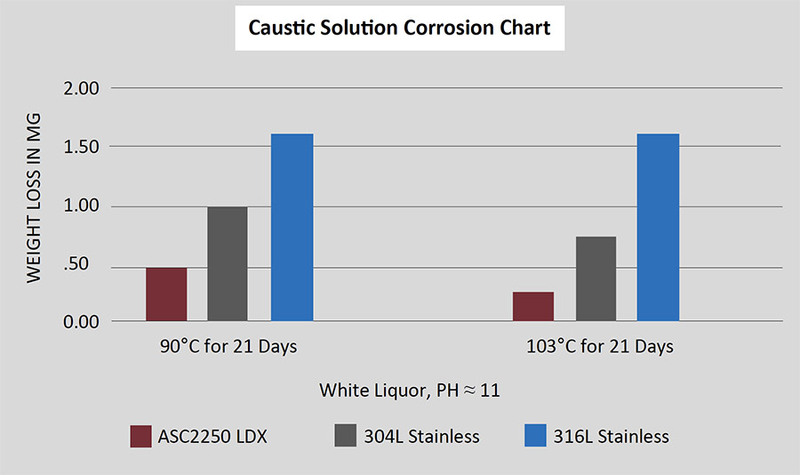 Testing in simulated “white liquor” shows less weight loss and superior corrosion resistance when ASC2250 LDX is compared against other common stainless steels. C2250 LDX resists fatigue failure in corrosive environments due to its unique combination of high strength and resistance to corrosion. The duplex grain structure of ASC2250 LDX , with its continuous Ferritic phase means this product is much less sensitive to stress corrosion cracking (Sulfide and Chloride). Austenitic stainless grades, such as 304L and 316L are more susceptible to fracture.